When the poster for Coco’s premiere at Mexico’s Morelia International Film Festival was revealed at the beginning of last month, many of us noticed some familiar characters, including Miguel, Mama Coco, and Dante. But the identity of the strange winged-cat-creature at the bottom of the poster continued to baffle us all – until today! The beautiful new character Pepita was exclusively revealed today on Remezcla – a news site focusing on new and emerging Latin culture and media. 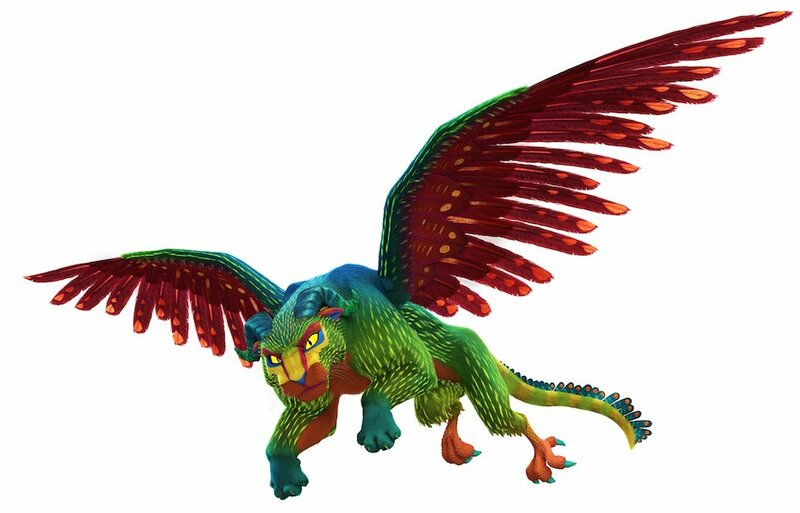 Pepita is based on an alebrije, which is an amazingly colourful Mexican sculpture of a fantastical animal. Particularly notable is the stylistic use of colour blocking and striking patterns. These influences are very apparent when looking at Pepita – a winged cat with horns, talons on her back feet, and contrasting colours of red, green, yellow and blue. Pepita will act as a spiritual guide in the Land of the Dead. As alebrijes aren’t traditionally associated with Día de los Muertos, it will be interesting to see what kind of creative spin the Coco team have given the holiday. She also won’t have any dialogue, so the character has probably been quite a challenge to get right. Pixar always do a wonderful job when it comes to animating communication without any words (think of Partly Cloudy, Piper, WALL•E, and The Good Dinosaur), so I have no doubt that Pepita will have just as much personality and emotion (if not more!) despite the lack of speech. Coco will come to US theatres on November 22nd, and UK theatres on January 19th. Watch The First Teaser Trailer for Coco!